Choose one of the following exercises. Do more than one exercise for extra credit. Write a short piece or compositional study (less than 5 minutes) which is generated solely by additive synthesis. You may use any program to generate the piece. Write a 1-2 page analysis/description of your piece. Experiment with sound masking (which is the fundamental principle used in MPEG audio compression). Choose a frequency (e.g. 1000 Hz) and set it to a moderately loud volume. Play a second sinewave (say 1100 Hz) at the same loudness and at the same time as the first sinewave. Can you hear both sinewaves? (I hope so.) 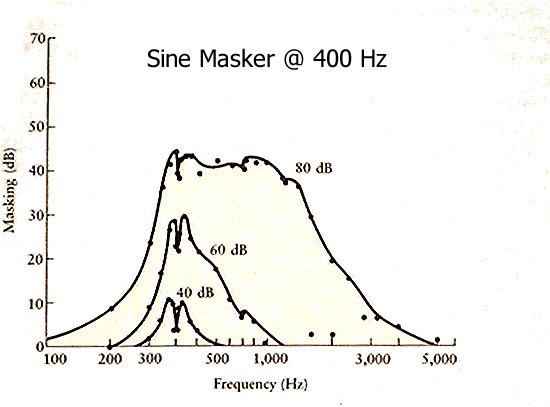 Reduce the volume of the second sinewave until you cannot hear it sounding with the first sinewave. Plot the loudness at which the second sinewave "disappears". Plot the masking loudness of about 20 frequencies for the same first sinewave. Compare to this sample plot. 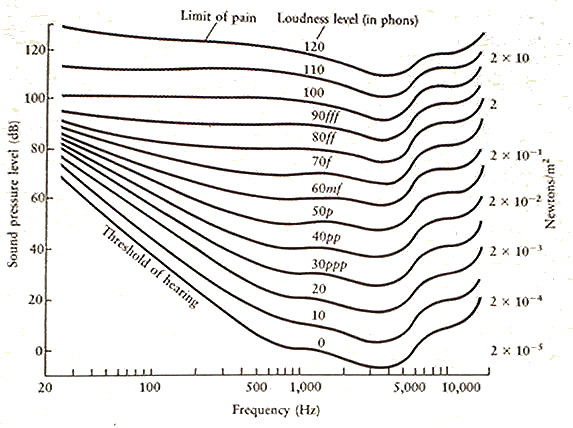 Synthesize timbres for various instruments from frequency data collected by Carl Seashore in the book Psychology of Music (Call number: ML3830.S4P8 1967 on reserve in the library starting Tuesday afternoon for 350.867). Have several people listen to your instrument syntheses and identify the instruments (don't tell them what it is before they hear it, of course). Which timbres were easy or difficult to identify? Write a 1-2 page analysis of the results.